It might feel like autumn has arrived but many people are still enjoying the last of the summer sunshine. Most of us are aware of the dangers of sunburn and skin cancer from the ultraviolet (UV) radiation from the sun, but did you know that this UV light and other radiation emitted by the sun can also be harmful to your eyes? Prolonged exposure to ultraviolet rays from the sun has been linked to many eye conditions, including macular degeneration and cataracts. It also causes photokeratitis which can give temporary vision damage. It may also surprise you to know that cloud cover doesn’t significantly reduce UV levels. Your risk of over exposure can still be very high even on overcast or dull days. 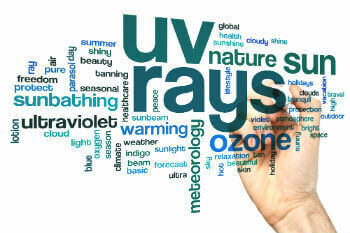 This is due to the fact that UV radiation is invisible and, unlike visible sun light, and it can travel through clouds. It is not just invisible UV exposure to be concerned about, a recent European study has found that the sun’s visible high energy radiation (HEV – blue light) can cause retinal damage and lead to the development of macular degeneration, especially in people with low Vitamin C and other antioxidants in their blood. To completely protect your eyes from the dangers of the sun’s radiation, you need to wear sunglasses which block 100% of harmful UV rays and also protect you from the high energy visible radiation. For the best protection for your eyes when outdoors, it is necessary to wear good quality sunglasses. 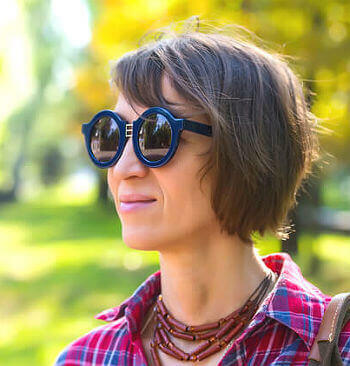 Look for sunglass frames with large lenses and a close-fitting style as they can limit how much stray light penetrates your eyes from outside the periphery of your sunglass lenses. This will also help protect the delicate skin tissue around your eyes. Your optometrist can help you to choose sunglasses that block 100% of UV light and also absorb most of the HEV blue light. The amount of UV protection a pair of sunglasses provides is not related to the colour or darkness of the lenses. For example, a light grey-colour lens can provide the same UV protection as a dark, almost black, tinted lens. But for HEV blue light protection, the lens colour is important. Most sunglass lenses that block this dangerous blue light will be a reddish-brown or copper colour. Again, your optometrist can help you choose the most appropriate lenses. Of course if you have recently undergone laser eye surgery you will not have to worry about wearing prescription sunglasses and can select the largest most fashionable designer styles. In addition another useful tip to ensure even further eye protection from the sun is to wear a wide-brimmed hat on sunny days. This will hot also help you protect your head from sunburn but can also reduce your eyes’ exposure to dangerous sunlight by up to 50%. Fed up with Prescription Sunglasses? Enjoy the sun safely and if you are fed up with prescription sunglasses, get in touch with our friendly experienced staff today on 0800 652 4878 to find out more about how we can help you and your eyesight and about the many other benefits of laser eye surgery.